The Somali Minister of Finance H.E. 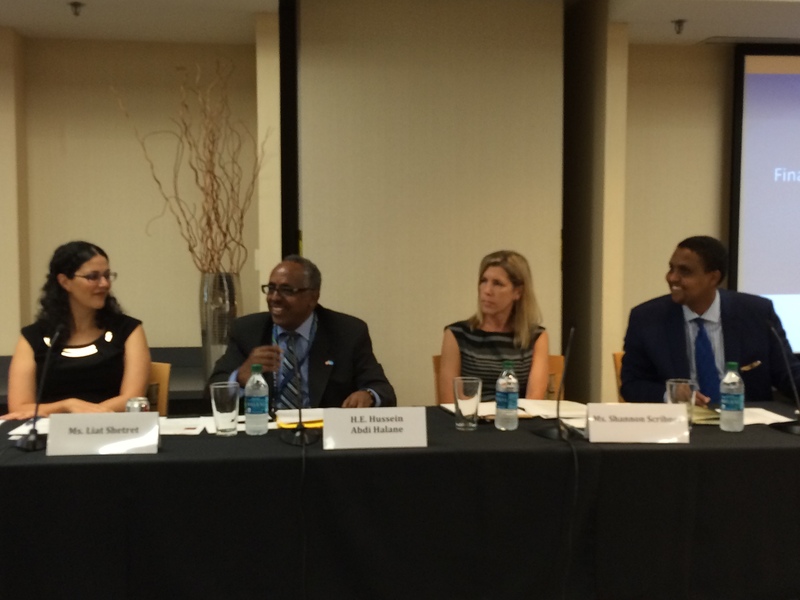 Hussein Abdi Halane served as the keynote speaker at a luncheon discussion on the Somali economic landscape held on the occasion of the first US-Africa Leaders Summit hosted by U.S. President Barack Obama in Washington D.C. The luncheon was organized by the Global Center in collaboration with Oxfam America. Panelists included the former Alternate Permanent Representative to Somalia, Ambassador Idd Beddel Mohamed; Ms. Shannon Scribner, the Humanitarian Policy Manager at Oxfam America; and Ms. Liat Shetret, the New York Office Director and Senior Analyst at the Global Center. Attendees included a broad spectrum of representatives from US and African governments, East African regional dignitaries, civil society organizations, and members of the Somali diaspora. Discussion focused on the past, present, and future economic landscape of Somalia, including ramifications of the 2011 famine on the economic health of the country and fiscal progress made under the Federal Government of Somalia (FGS). Panelists offered insight into the hawala system, ways to strengthen public financial management, and opportunities to capitalize on the enduring Somali entrepreneurial spirit. The Global Center continues its focus and ongoing work on financial integrity and inclusion, particularly related to strengthening AML/CFT capacities in the Greater Horn of Africa. For further information about this event, please contact Ms. Danielle Cotter at dcotter@globalcenter.org.